With the annual SIA ski and snowboard industry tradeshow having taken place two weeks ago in Denver, talk is already afloat in the snowboard world of what’s on the table for next year. 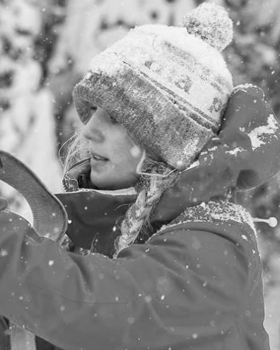 Having had a slow snow season so far, I thought now would be a good time to liven things up and do a little reflecting on the improvements being made in technical women’s clothing. Let’s take a look at some of the continuing trends in womens snowboarding clothes this season has brought. If you are involved in the snowboard industry, either as a professional or an enthusiast, you know it moves fast. Fits, features, cuts, and colors are all constantly changing and being re-tooled and redesigned to meet the whims of a constantly growing, individualized sport. But that’s what we love about it: it’s progressive. This sport is always bringing something new and interesting to the table–and that’s part of the individuality and creativity that draws so many to its ranks. As the level of riding at a professional level has progressed each season, so has the technicality of the outerwear needed to meet the demands of the riders. We’re seeing a lot more jackets and pants now with RECCO avalanche reflectors built in each season, as well as things such as The North Face’s Know Boundaries Snow Safety Label, which is included on their Cryptic line of snowboard outerwear. This label includes a checklist for all of the essentials you’ll need for any backcountry excursion. These types of improvements, as well as increased amounts of Gore-Tex and other premium fabrics being used in garments, show a definite rise in more technical pieces. Aside from the purely technical, manufacturers are starting to realize that a man’s jacket in a different color is still a man’s jacket. More companies are spending the time to really tailor their women’s lines to be more form and fit conscious. Jackets, and pants in particular, are being made available in more form fitting shapes and cuts, as well as utilizing female-specific body mapping techniques for insulation placement and thickness. Look for more pants to take on the cuts and shapes of your favorite jeans. The industry has seen a flood of more specific “low-rise skinny” and “straight-leg regular fit” pants over the last couple seasons, as opposed to simple slim, regular, and baggy fits, so be sure to do your homework when purchasing. In terms of styling, companies are designing jackets and pants with interesting pockets, zippers, and other functional design details and elements, many taken from classic military looks. A lot of brands are adding a bit of duality to their designs, making jackets that look just as good off hill as they do on. Faux fur was also at play this season, as a functional yet fashionable addition to many jackets. Be sure to go for the removable kind- it makes washing much less stressful. Lastly, we come to the colors. Jacket and pant color schemes seem to be taking cues from nature. There were a lot of dark and rich purples, violets, reds, and other berry shades. These were coordinated with more earth-toned colors such as tans, olives, and off-whites in many collections. As more and more brands seem to be striving to go the Eco-friendly route, their color stories reflect this. However, the ultra-bright and neon colors are still present, as they will likely always have a place in the heart of snowboarding. Who doesn’t love a pair of hot pink, zebra-striped goggles or lime green pants every now and then? This, again, is part of the allure to the lifestyle. There is always something different out there people can use for their individual expression. As snowboarding rides the line between art and sport, this is essential. « Are You Always Freezing? Try Columbia’s Omni-Heat.